Every choral festival or competition is unique. The biennial Marktoberdorf Chamber Choir Competition in Bavaria alternates with their innovatory Musica Sacra International Festival (reviewed last year and now seriously threatened by religious bigotry, see article Blinkers Off! ); both events famous world wide. Sixty choirs applied to be considered and fourteen were selected and invited. The competition is held in Marktoberdorf's enviable Modeon, a modern arts facility with a fine flexible concert hall, acoustically ideal for critical listening. The opening event interspersed recognition of support and sponsorship from organisations, local and regional government, and numerous individuals of Ostallgäu, with a great concert by former prizewinners, the Renner Ensemble, Regensburg, a sixteen-voice male choir with counter-tenors to provide a full range of register. The following packed days made for an exceptional experience in our year's listening; we heard eight choirs giving 25 mins programmes in contention at the Modeon, and in the evenings concerts shared between two of the choirs in the beautiful Bavarian churches, with their more flattering acoustic. The programmes were all introduced with great good humour by Monika Schubert and (in impeccable English) by Jeroen Schrijner, President of Europa Cantat - the European Federation of Young Choirs. 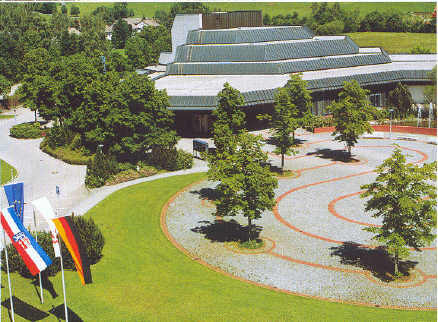 Unlike the far more inclusive Cork Festival last month, which had hosted numerous Irish national choirs and a smaller number of invited international choirs, Marktoberdorf (director Dolf Rabus) is a meeting place at Whitsun for crack international chamber choirs (16 to 36 singers). These are of so high a standard that the non-professional stipulation (members "must be amateurs, i.e. the majority must not earn their living by singing") does not prevent their music-making from challenging top professional choirs anywhere. Choirs from 9 countries and 4 continents were selected to compete from 60 strong applicants (regrettably, in these sensitive times, the San Beda Chorale from the Phlippines had, despite all efforts, failed to achieve visas to permit its college members to come to Germany). Also, never to be forgotten, are the financial constraints which have made it necessary to reduce the number of choirs progressively; this year the competition had to be shortened by one day. The competitive submissions were sung without applause until the end, so that we were easily able to forget the competitive element and to enjoy the presentations as recitals; we had a particular interest in repertoire chosen and the building of coherent sequences to incorporate the well chosen compulsory items (Dallapiccola Estate for the male voice choirs, and Gesualdo's Dolcissima mia vita for the mixed choirs) neither of which palled with repetition. The rigorous selection of participating choirs ensured so high a standard that rating their varied excellences was not a priority for us, and many choir members with whom we talked felt likewise that the privilege of being part of the whole was the main thing; winning or not of lesser concern. Impressive musicianship was exemplified by a teaching session we attended for two of the choirs together; sight-reading a piece new to them resulted in near-performance standard at first run-through! The Cardinal Singers from Kentucky (second prizewinners) impressed with their technical virtuosity in well varied programmes. There was a special prize for the most interesting competition programme, and this went deservedly to the overall winners, Sweden's Simon Philpps Vocal Ensemble from Gotebörg. Amongst individual items heard in competition and in concert which especially impressed us were the spectacular precision and relaxed tension in Matushita's Yagi-Bushi (Japan's Ensemble Pleiade), Neumann's Firerider and Mantyjarvi's Pseudo-Yoik NT (Utersen Choir), and the mellow blended tone and pliant phrasing of Cantabile Limburg in Strauss's Traumlicht. The Venezuelan Ensamble Les Trouveres' programme, given by memory under their singing director, pleased as a whole, Ravel's Trois Chansons and Rautavaara's Lorca Suite particularly memorable, and it was great to hear them giving their folkloristic repertoire informally to a packed local audience on Sunday morning, in the marquee erected specially for the festival. Latvia's youth choir Balsis maintained the esteem in which Scandinavian and Baltic choirs are held, and their whole programme delighted. Appearing in striking national costume, the girls had woven their garlands of buttercups from the meadow, full of bird-song, adjoining Modeon. An arrangement of Mahler's Die zwei blauen Augen (Wayfarer's Songs) was notably memorable. In an afternoon sociable get-together of all the choirs, their two directors Agita Ikauniece and Ints Teterovskis revealed themselves as accomplished operatic soloists in a spoof Italian operatic scena. From our perspective as 'generalists', not choir specialists, several lengthy and hugely demanding items won our admiration. The Norddeutscher Figuralchor probably ruled themselves out of top contention by the repertoire they presented, but gave us two marvellous experiences, with Strauss's racy and unpublished Die Gottin in Putzzimmer (alluding to his wife's untidiness!) and Schonberg's Friede auf Friede (horrendously difficult, emerging as beautiful and deeply moving) plus, in their church concert, Bach's great motet Jesu meine Freude (often sung with instrumental support to prevent the pitch falling, but not by these seasoned virtuoso singers). And the internationally scattered singers of Ensemble De La Rue, based in Canada and who meet 'from time to time when they can', yet still achieve wonders, brought a novelty from their Australian conductor's homeland, a challenging post-modern setting of a stream of consciousness text, Memory Pieces (1994) by Steven Adams, which was the most innovative contemporary music heard throughout our days in Ostallgäu, but was received attentively and respectfully by an audience chilled to the bone towards the end of an overlong concert at St Michael, Altenstadt which finished with the great motet Ave Dei Patris Filia by John Taverner (the live recordings made there are superlative). Some choirs will have been left out of this summary of our own personal highlights in Marktoberdorf 2005, but it is crucial to recognise, as we heard from several of the singers, and from members of the jury who had the invidious task of rating them, that just to be chosen to participate at Marktoberdorf is itself to "win". The full results are on line at the Marktoberdorf Music Academy's website. All the choirs were digitally recorded throughout the competition and high quality inexpensive CDs are available for purchase. There are also photo-CDs packed with shots of choirs and audiences, and socialising between times, which make splendid souvenirs. We were grateful during the festival for CDs received from some of the choirs; most of them have websites which include their own discographies and are easily found. 1. Defining contemporary music is an almost insoluble problem, exemplified in what the choirs chose to sing for the post-1920 Marktoberdorf requirement. Jaakko Mäntyjärvi from Finland, in a fascinating seminar at Cork 2004, raised for intending composers of choral music some 'taboo' issues and inherent paradoxes, viz. 'The best is that choral singers are mostly "amateur", bringing a better attitude and extra enthusiasm to music making; a 'grape-vine' effect disseminates good new repertoire widely, and composers can find themselves surprised to receive royalties for performances in far away countries, of which they had been unaware. 'The worst is that choral singers are mostly "amateur", with extremely variable technical levels of accomplishment and capability. - - There are very few fully professional choirs in the world, so tailoring music for specific choirs can lead to the common experience of 'farewell premieres'. Not many composers are comfortable with writing for choirs and personal co-operation is highly recommendable for commissions to succeed. Performance targets should be slightly higher than current levels - 'feasible, not unreachable'. There is 'a fine line between challenge and frustration'. Some other competitions specify later cut-off dates for that category, e.g. 1945 in Hungary (year of Bartok's death) and 1960 for Helsinki 2006, but those do not preclude anachronistic tonal music or compositions of the 'new simplicity' school. That makes sense for competitions which admit choirs of widely varying standards, but Marktoberdorf might decide that its competition could grasp the nettle and indicate somehow that their elite invitees, all of around the amateur/professional divide, could achieve better comparability in this area (as they do by requiring set pieces) by indicating that the competitors should offer non-tonal pieces which really challenge pitch and rhythm? 2. It would be better if the items in the evening concerts were listed in groups, to discourage intrusive applause after individual songs, and allow audiences to absorb the atmosphere in the churches and the music to reverberate in our minds. That is now normal in solo song and lieder recitals, which used to be bedevilled with applause after each song, which became meaningless and irritating. 3. The Marktoberdorf programme books are collectors items, produced to the highest standard by editor Brigitte Riskowski with Dolf Rabus. It would help if, in addition to the indispensable texts and translations always provided (unusually elswhere), we might be given dates of actual composition (when known) alongside composers' birth/death dates. And a little background about some of the lesser known composers, maybe in spoken introductions as space must be limited, would also assist listeners' orientation to the music.